Are big earrings making a definite comeback? Today I ordered double hoop earrings from one of my favourite designer hub to shop online, but truth is I had them on my mind for a while, and mixed feelings about the purchase. However this afternoon I saw a picture of my favourite blogger wearing hoops and I thought, hm that is sure a sign it was a good decision. Hoops made a light comeback in 2017, which I ignored because it reminded me of my teenage years, when I was all about pink and styling casual styles with girly shoes, mixing an everyday look with posh accessories. I was not a mess, don’t get me wrong, I still managed to look decent and combined everything properly. But teenage years are always a life era you want to leave in the past, since many trends went from cool and stylish to rather trashy. It seems history is a pendulum in fashion too, since these made a comeback last year and will probably stay in 2018. Now, statement and asymmetrical hoops are on the trend for 2018. Will they survive or will they become a fad? Regarding hoop earrings, to which I still have mixed feelings, they are simple earrings but somehow they make a statement. Should they be back for good? It looks like 2018 wants to add more light to them by bringing the asymmetrical ones to our outfits. Statement earrings have been always my favourite, and outfit helpers when you get those “I have nothing to wear” crises. You can just simply go with a total black outfit, total white, or jeans and regular sweater one, and add a pop of color in your ears. The only thing that messes with me is their weight. 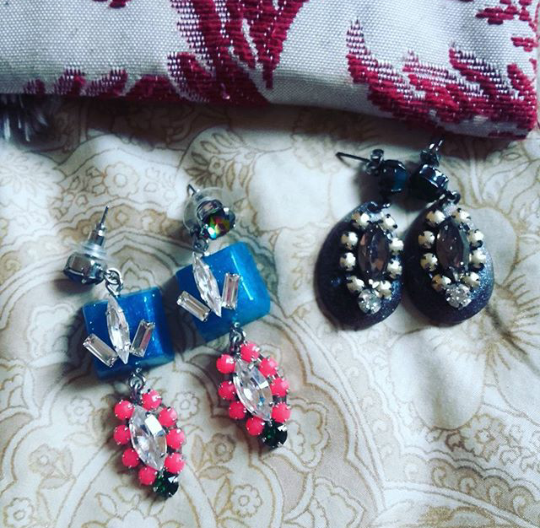 So I leave the really big ones for special occasions where I can take them off anytime, and usually wear Miss Julie earrings I bought on Trendcy, which are not super long, but long enough. Which earrings are your fav to make a statement? Today, January 15, is Blue Monday (3rd Monday of January). Blue Monday was the name given to the apparently most depressing of the year. This idea of the most depressing day of the year resulted from a calculation/equation that mixes many factors such as weather condition, debt level, Christmas holidays are over, and enough time to see many have not fulfilled or even started with our New Year’s resolutions, etc. After this date we can only think about February, which comes with Carnival and Valentine’s Day (have you already picked something up? Here is a promotion on the best Valentine’s gift 2018). For this post I chose different materials but all in the same color, so blue was in my jeans, jacket and bag. This medium bag comes with a strap that can be put on so you can carry it as a crossbody bag, or just on your hand. The bottom has some studs in silver and golden tones and it has a pair of tassels to close and open the bag, since it comes without a zip or button. However there is a small purse inside which can be zipped up where you can keep your keys and money. The leather jacket became very known among fashionistas a couple of seasons ago, but in yellow. I did not follow the yellow trend then and opted for this blue, which can be styled in every season of the year –though I prefer to wear it around Spring. The star of the outfit may be the bag, since it pops up with its color and studs. It is from Rosegal, an online fashion store with many styles and different prices, which is now offering great deals regarding the upcoming Valentine’s Day next month. For those of you who are thinking about buying something to your SO, a Rosegal Valentines Gift is surely a good option.